For decades there has been a plethora of ways to connect M2M and IoT devices – satellite, GSM 2G, LTE, NB-IoT and LPWA. Satellite-based M2M has gone from strength to strength throughout the development of all these new forms of IoT connectivity. With a 5G world around the corner, will satellite-based M2M/IoT finally meet its match or continue from strength to strength with new opportunities for partnerships and collaboration? NSR’s M2M and IoT via Satellite, 9th Edition provides analysis on this critical question. 5G is often defined as a network of networks. One of the main targets of this transition is providing a uniform network involving many technologies, including satellite as a critical component. 5G network implementation is finally coming after years of planning where in the U.S. for instance, all big 4 operators have started building out 5G networks, and where Verizon has launched its own proprietary ‘5G’ home Internet service. Spectrum proceeds aside, the true benefit of 5G from a satellite perspective is that it opens the opportunity to seamlessly integrate with ground networks and consolidate technologies to provide a way for satellite to be integrated from a platform operational perspective. This includes leveraging Network Functions Virtualization (NFV) and Software Defined Networking (SDN). With this simpler integration between terrestrial and satellite networks, this can provide a new growth potential for M2M/IoT, specifically in terms of backhauling IoT data from terrestrial networks. This is especially the case for intermodal units and fleets. The good news is there is already significant, demonstrated demand for this. For example, Maersk Line installed a suite of sensors, including GPS, and terrestrial modems across 270,000 refrigerated containers, which are backhauled over L-band satellite connectivity across 400 ships. Many further deployments are expected when the benefits of 5G connectivity for IoT devices become fully realized. Hispasat is already performing tests on the design of hybrid networks between satellite and 5G in Barcelona where the aim is to validate satellite network ubiquity for extending the range of 5G services to areas with poor or no connectivity. The initiative could set the stage for widespread collaboration with M2M/IoT operators and systems integrators. While there is significant potential, NSR notes that plans for mobile operators to deploy 5G are at a similar pace as 4G networks, which means that it will be years before handsets and IoT hardware are available to take advantage of 5G. Realistically, this means the benefit to satellite from this integration won’t be felt until 2023 and beyond. How does satellite stack up? Other than 1ms latency, satellite M2M/IoT is already competitive with all other benefits outlined above. This is a key reason why customers will continue to subscribe to satcom based M2M/IoT. It Is likewise worth noting that most applications do not require ultra-low latency in the millisecond range. Further, the cost of satcom based M2M is continuing to decline, and this price elasticity results in accelerated demand growth. For example, service revenues from Iridium’s commercial IoT service have declined to $13 per month, representing years of decline, but have led to Iridium’s IoT subscriber numbers increasing at a 24% CAGR level from 2010 to 2017. 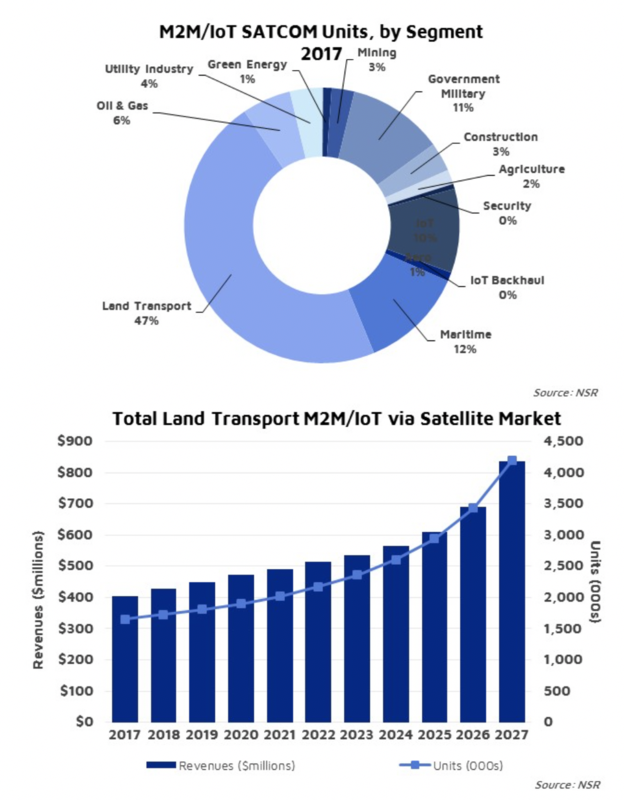 Other satellite operators are reporting similar growth stories for M2M/IoT, and new markets will open with IoT-focused small satellite players that are expected to fully launch their constellations by 2023. These new entrants and the ecosystem(s) being built around them will provide an added layer of competitiveness surrounding satellite-based M2M/IoT offerings in the face of 5G competition. In terms of key market segments, NSR forecasts satellite demand from Land Transport alone to exceed $800 million in retail revenues by 2027. This goes to show that despite terrestrial LPWA and NB-IoT rollouts, demand for highly reliable, single platform and secure connectivity through satellite isn’t going away. For fleets, cargo shipments and inter-modal applications with hundreds, thousands, or tens of thousands of devices, the advantage of satellite remains especially pronounced, given the point to multipoint benefit of large area updates and modification of devices (including system and firmware updates). While M2M and IoT via 5G terrestrial networks is sure to take away some of the satcom IoT market from the lower end, the core benefits of satcom M2M/IoT will remain in face of new forms of connectivity, just as it has with all other terrestrial network implementations. 5G will add many benefits, but still not enough to persuade the core base of end users to churn from satcom M2M. Rather than eroding the satcom M2M/IoT market overall, 5G actually provides new opportunities for satellites to integrate with terrestrial networks and backhaul IoT services that will ensure continued M2M/IoT revenue growth streams in an increasingly 5G connected world.